and student action to rid our city and oceans of toxic and polluting plastic foam! for all schools to use FOR FREE ! 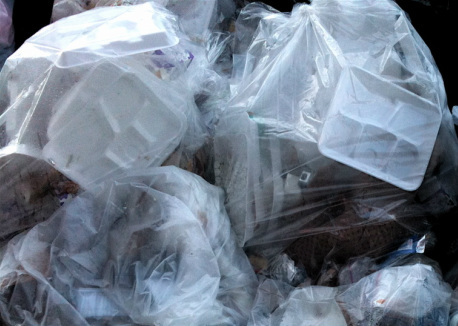 NYC schools used to throw away 850,000 styrofoam trays per day. Stacked up, that's 8.5 times higher than the Empire State Building! Ready to get rid or all the single-use plastic packaging in your cafeteria? Our movie, microplastic madness, is coming this spring! You won't want to miss seeing what Brooklyn 5th graders did! follow us or sign up for updates here! ​THIS NEW SCHOOL FOOD PLATE IS CHANGING EVERYTHING! 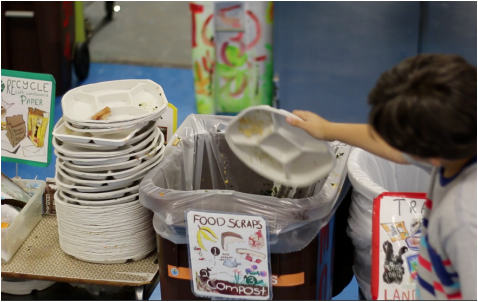 The unprecedented 11-city contract for new school compostable plates eliminate over 1/2 a BILLION toxic and polluting styrene foam plates annually from over 4,000 schools, creating a dramatic domino effect of zero waste progress nationwide! In 2013, NYC announced the decision to eliminate 860,000 styrene foam trays used per day in all 1,800 public schools. This sparked the formation of the 6-city Urban School Food Alliance (USFA) for collectively purchasing compostable plates to drive down cost and maximize the purchasing power of the 6 cities. This is also created a domino effect, supplying city officials with additional reason to support school and residential compost pick-up. Are you working to get styrofoam out of your school and/or school district and need some help? Please contact us and include your school information. OR sign up here -> ​and check off the box at the bottom, "My school needs help getting rid of styrofoam"
Take the first step to rid your school of styrofoam by starting a Cafeteria Ranger Program today! The student-led Cafeteria Ranger Program engages the entire school on waste reduction and zero waste. By engaging all students as Cafeteria Rangers, the program ensures long-term but-in of cafeteria waste reduction initiatives while making change fun! Learn more -> It's free! THIS IS A HUGE ENVIRONMENTAL and GRASSROOTS VICTORY! Earth Day 2010, STYROFOAM BAN Press Conference with State Senator Liz Krueger, then Public Advocate Bill de Blasio, Assmeblymember Brian Kavanagh, students, parents and Debby Lee Cohen (Director Cafeteria Culture/Styrofoam Out of Schools) speaking passionately about eliminating Styrofoam trays from schools. CafCu puppeteer-volunteers took our giant puppets to the streets! CafCu, founded in 2009 as STYROFOAM OUT OF SCHOOLS, met with School Food Directors and asked for a 20% reduction of styrofoam in 1 year. We reached that goal by working together. It took lots of creative problem solving and the building of partnerships to eliminate styrofoam from NYC schools. 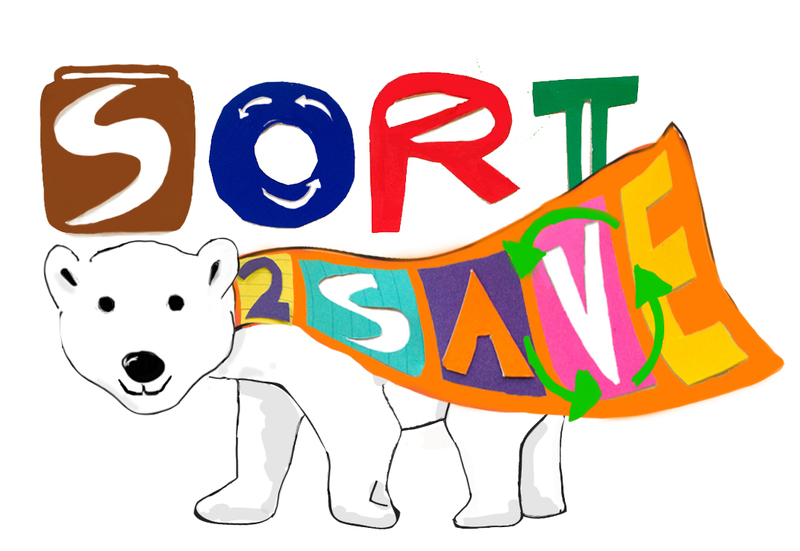 The SORT2SAVE KIT is here! Try this free and fun resource and achieve a student-led near-to zero waste cafeteria today! It started with a group of public school parents and took 6 years of perseverance and creativity! We built an unlikely and trusting partnership with NYC School Food and Parsons. Remarkably, within just one year, our grassroots org catalyzed TRAYLESS TUESDAYS citywide. To date, this initiative alone has already eliminated over 100 MILLION styrene foam trays used per day in NYC schools. We created giant NO-STYRO data PUPPETS, each made of 500 used and washed lunch trays. We took the puppets all over NYC and to City Hall. People laughed first, then heard our story of toxic and polluting styrene foam and were inspired to take action! We built cross-sector coalitions with communities, schools, manufacturers, government, and other NGO's, sharing product, system, and education ideas. We introduced new products and systems to government agency directors, including potato trays, in vessel composting machines, and Effective Microorganism composting. 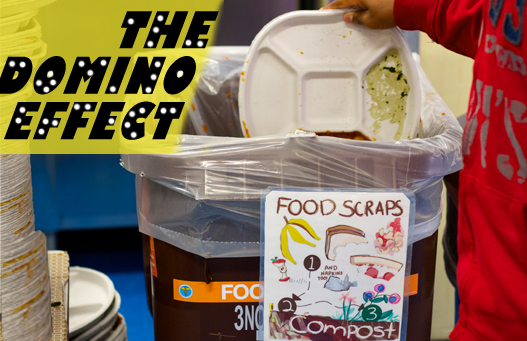 We piloted cutting-edge K-8 curriculum to support zero waste cafeterias, connecting NYC's garbage plight to environmental injustice and Climate Change. We piloted the Cafeteria Ranger program, training students as young as Pre-K, to oversee all recycling and composting in their school cafeteria and classroom. We led MAKE CHANGE MESSAGING workshops, teaching students to advocate for their own issues, including ridding the city of styrene foam! We led prototyping workshops, giving students, the USERS of school lunch trays, the opportunity to design, construct and test out their own designs! We presented unknown issues around school cafeteria garbage and culture to parents, teachers, School Food Directors, elected officials, and solid waste experts! We regularly shared vital on-the-ground information with elected officials and government agency directors. ​ in order to be achieved. We helped initiate a public-private partnership between parents and a private trash hauler that led to the city's first school organics pilot! We replied to hundreds of emails and calls from students, teachers, parents, school administrators, and government offices in NYC and ALL ACROSS THE US! We built our own website, designed original graphics and signage, made our own video shorts, and shared our work and our knowledge with everyone looking to eliminate styrene foam in their community. WE DID ALL OF THIS ON A SHOE-STRING BUDGET, and with the help of many wonderful volunteers and thousands of volunteer hours! We are ready for the next great challenge. NYC Schools threw "away" over 3 BILLION styrene foam trays over 25 years. Thank you parents, students, school staff, concerned citizens, elected officials and Department of Education School Food Directors for working with Cafeteria Culture for 6 years to replace the foam trays with compostable plates! New York City schools were using 860,000 polystyrene (aka "plastic styrene foam") trays per day for 25 years, adding up to over 3 BILLION foam trays thrown away and exported to out-of-state landfills and incinerators. ​Low-income and minority neighborhoods are disproportionately impacted by the carting and disposal of NYC's garbage. Most of the city's waste transfer stations are located in the South Bronx and Northern Brooklyn, overburdening these communities with enormous environmental problems caused by hundreds of carbon spewing trash trucks entering and leaving these neighborhoods daily. NY Times article, JUNE 10, 2011 Continue reading the main storyShare This Page Share Tweet Pin Email More Save , "Styrene is mostly a concern for workers who build boats, car parts, bathtubs and shower stalls. Studies of workers exposed to high levels of styrene have found increased risks of leukemia and lymphoma and genetic damage to white blood cells." The chemical styrene, a major component of polystyrene trays and food containers, has been categorized as a “reasonably anticipated to be carcinogen" by the US Department of Health and Human Services. Styrene is toxic and polluting from the start of manufacturing and forever thereafter. - After a usage time of about 20 minutes, whether incinerated, landfilled, littered, or recycled, styrene containers leave a trail of toxic particles that will last forever. Cafeteria Culture, founded in 2009 as Styrofoam Out of Schools in 2009, catalyzed Trayless Tuesdays throughout all of NYC's 1700 public schools within one year's time by creating an unlikely partnership with NYC Department of Education Office of School Food and Parsons. This initiative alone, eliminated 100 million polystyrene trays from school lunches, landfills, and incinerators at no additional cost to NYC! We achieved our first goal and more, completely eliminating polystyrene trays from all NYC schools, as well as from the 5 largest U.S. school districts. For 25 years, NYC school garbage has looked like this!. Cafeteria Culture has dramatically changed school garbage by creatively collaborating with students, school staff, teachers, elected officials, manufacturers, NGO's, community organizations, government agencies, and elected officials. This is how democracy should work! ​right in the school cafeteria! Cafeteria Culture's award winning E->STEM school programs have been significantly decreasing NYC public school environmental footprint and greenhoyse gas emissions. Our Cafeteria Ranger Program helped NYC government officials visualize the achievability of zero waste cafeterias, even in schools with many daily challenges. ZERO WASTE LUNCH CHALLENGE at PS/IS 34 Manhattan. Sixth grade students holding 13 ounces of garbage, the only trash created from the entire school. Since 2011, Cafeteria Culture has been leading innovative in-cafeteria and classroom E-STEM education, training and workshops, empowering students to be Cafeteria Rangers, who oversee all cafeteria waste sorting, recycling and composting. This curriculum is hands-on, inter-disciplinary, and in alignment with both STEM and STEAM (putting the ARTS into STEM education). 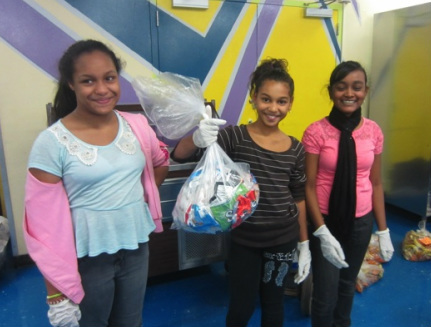 ​ Learn more about our ARTS+ACTION Cafeteria Waste Reduction school program here.